Twelve villas with valley views clustered around a perimeter overflow swimming pool above the Petanu River, Ubud Dedari Villas are perfect for a rejuvenating break from busy city life. A haven for birdwatchers and nature lovers, forest life abounds at Ubud Dedari. From birdsong filled mornings to the evening insect symphony, you’ll have the chance to interact with Bali’s rich natural environment from the comfort of your villa’s verandah. Friendly geckos may even occasionally be found in your room – a portent of good luck to come! 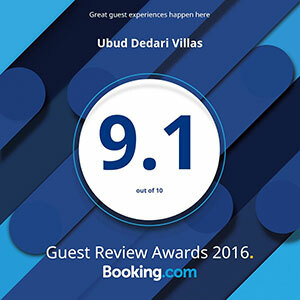 If you’re looking for a relaxing getaway far from the hustle and bustle of city life, but handy to the attractions of the cultural heart of Bali, Ubud Dedari Villas is the place for you.